ticketmaster® (as they style themselves) has added a new feature to their gouge-pricing business model (13.6% add-on at the end of the process in this latest instance): social engagement. They started sending me an email every day, and never mind my "unsubscribe from all" yesterday, here's another one today. "It's Your Turn In The Spotlight" the email offers, with a link for me to "Share My Review," and drive more business their way. Their horrid business model notwithstanding, I appreciate the reminder. Our turns in Opera Idaho's spotlights have come and gone. I see from their performance history it was 1994 when we were in the chorus for a production of Puccini's masterpiece, Madama Butterfly, that same Morrison Center stage. It was only 90 years old then. At 114, you'd hardly know it has aged. Opera has always been an acquired taste. My mother loved it and I didn't understand exactly why, until I actually went to a performance, and experienced a beautiful, unamplified voice filling a 2,000 seat hall. It was love at first hearing. At the intermission of Sunday's matinee, I was listening to the Children's Chorus performing over the top of the patrons milling about refreshments, while Jeanette chatted with some friends who weren't thrilled by the first act. "There isn't any action," one said. "It's boring. Is there going to be a fight scene?" [Spoiler alert] "No, he goes back to America, returns three years later and she kills herself," Jeanette answered. Did they stay for Act 2, fortified by some coffee? Don't know. One of the most thrilling parts for us had literally no action. Three actors upstage, silhouetted behind a shōji. From the orchestra pit, unseen, the wordless "humming" chorus. (The score has pages of "Oo - - - -") Nothing happens, for two and a half minutes, an overnight vigil that recapitulates three years of waiting. The first pizzicato notes from the violins, the first vocalise, give thrills that transcend time completely. The careless, casual betrayal, the exploited cultural divide, the horror of realization, the heart-rending sacrifice, and the ultimate despair; we've turned another century, and are still mired in this same plot. Lieutenant Benjamin Franklin Pinkerton has been promoted, and, unlike the slightly more gracious original, has yet to show any sign of recognition or remorse for what he's done. He (and his whole family) and the consul are still making arrangements to grab whatever they fancy, taking out a 999 year lease, subject to monthly renewal, brokered by a quisling happy for a small cut of the deal. In life imitating art imitating life, there was a conspiracy theory (described halfway through the comprehensive 2015-2016 Educator Guide from The Met) beneath the infamous 1904 opening at Milan's La Scala. "A disruptive claque that carried the rest of the public along with it" was presumably set off with a discreet (or not so discreet) cash inducement. The vindictive rumors of the work's death were premature; four revisions and two years later, it was revived in Paris, and is still enjoying a long and productive life today. 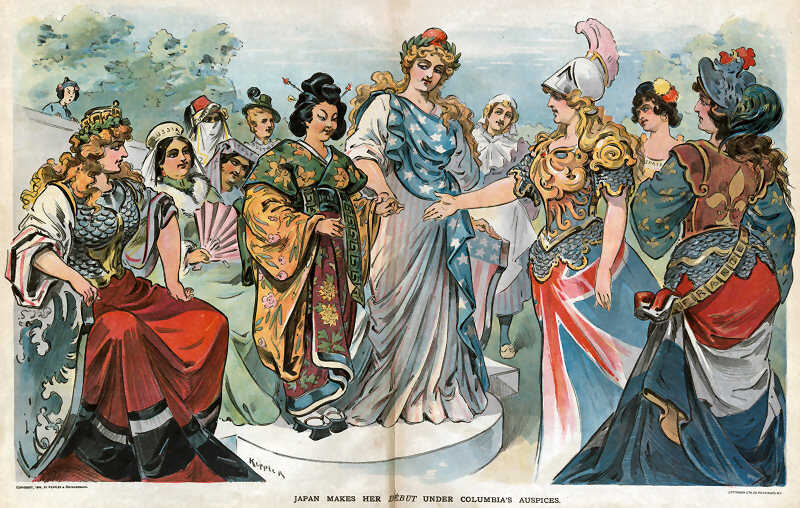 Filling in the context, from the U.S. Navy steaming into Tokyo harbor in 1853, to a French navy officer's dalliance in 1880s, The Met introduced me to Puck and Judge magazines, and their popular cartoons personifying nations. The Library of Congress has a beautiful digital scan of Udo Keppler's chromolithograph, Japan makes her début under Columbia's auspices from the centerfold of of the August 16, 1899 issue of Puck. While tracking down the higher quality version, I also landed in the middle of "Civilization & Barbarism," Ellen Sebring's brilliant and disturbing survey of those good old days when the march of civilization was subduing the non-Western, non-white and non-Christian natives for fun and profit. Japan's qualification for joining the sorority was its defeat of China in 1894-95, leaving the latter exiled to the distance, outside the garden wall. Further down the section titled "The White Man's Burden," there's a cartoon using that title of a newly minted Rudyard Kipling poem, and deserving the top-of-page warning for "images of a potentially disturbing nature." I suspect most fortboise readers will find Victor Gillam's image no less than genuinely disturbing today. Perhaps to the audience in the first decade of the 1900s, the story was lighter dramatic fare about an unfortunate, naïve teenager, and the question of whether Puccini had put in full effort in his composition was more pressing than the cultural allegory. A century later, more than a few murderous conflicts remain unresolved. Page forward to Progress & Profits, and Victor Gillam's image of Uncle Sam astride his Auto-Truck of Civilization and Trade, lighting a pathway through the darkness, armed with ample "Force if Necessary," and prepared to make the 400 million barbarians on the dragon to back up. A century and some into the future, the numbers have scaled up, but the basics don't seem to have changed much. The president has called for an additional $54 billion for Force if Necessary this year, more than the whole military budget of the United Kingdom.